Fabric and carpets require special treatment to withstand the elements and ground in dirt. Pets, Children and many hobbies of today’s lifestyle can lead to early deterioration of your fabric seats and vehicle’s carpet. Unlike regular coatings the nano particles of I1 actually coat the individual fibres of the fabric thereby leaving the “breathability” and feel of the fabric unaffected. The former means that stale air can still escape but at the same time repelling any water or oil based liquids. Being solvent based ensures a much deeper penetration of the active ingredient giving an I1 treated surface much better durability and overall performance. 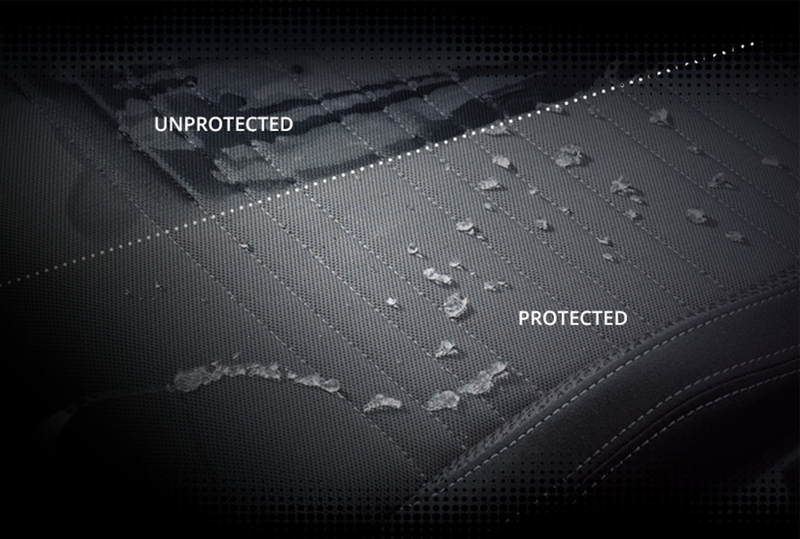 Typically an I1 treated surface will outlast conventional water repellent coatings by a factor of approximately x 5 with durability on soft-tops for example, lasting as much as three years. Wine, coffee etc. simply rolls off the surface and can be wiped away with a damp cloth with zero staining. I1 coats each fibre individually which means the texture of the fabric remains unaffected and allowing fabric to “breathe”. Works well on convertible roofs with great durability.